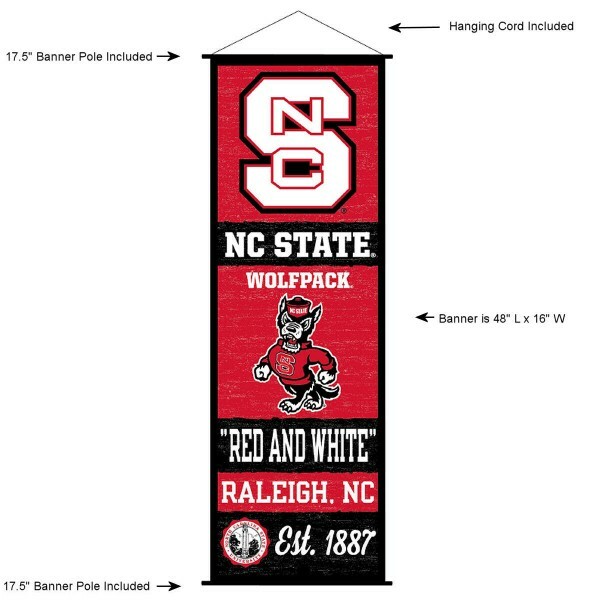 Our North Carolina State Wolfpack Wall Banner and Door Scroll is made of thick 300D polyester, offers single-sided screen printed logos and graphics, has a double stitched perimeter, and has an overall dimension of roughly 17.5" x 48" with the polyester banner measuring roughly 16" wide by 48" in length. In addition, this "Ready to Hang" banner kit includes both bottom and top PVC banner poles each measuring 17.5" wide by .75" in diameter and includes a sturdy matching black colored hanging cord. This large wall and door banner can be used indoors or outdoors and be hung on any wall or door to display your team allegiance at home or the office. In addition, this item is NCAA Officially Licensed by the North Carolina State University which ensures correct insignias, authentic colors, and premium quality.